Stop wasting your time, money and energy on trying to be someone you’re not. Just be yourself. Authenticity is a word that perhaps may be overused. However, it’s the word of the day when it comes to building relationships, developing partnerships and acquiring new clients. Being authentic is simply being you while not trying to rescue others from what you may hallucinate are your flaws and imperfections. Your perceived flaws and imperfections are simply part of who you are. No one is void of them. Learn to love them and leverage them. Being authentic is indeed being vulnerable and yet knowing you can handle whatever may come about as a result. There is a power that comes from the knowing the real gold comes only from putting yourself out there in an authentic way. You are being authentic when you follow your gut. I can’t tell you how many times I hear from people that end up in precarious situations that they had a hunch or an inkling about a person they regret getting into a relationship with. Many tend to shame themselves for not listening to their gut. Learning to follow your intuition is the path to living authentically. The actress and singer Judy Garland put it so eloquently when she would say, “Always be a first-rate version of yourself rather than a second rate version of someone else.” Call it being authentic, original or unique. You are blessed with various innate talents. Identify those gifts. Nurture them and endeavor to share them with the world. Your ideal client wants all of you; not the second-rate version or the polished imposter. We share a program with many of our clients that walks them through how to identify who their ideal client really is. Once they are clear on who that ideal client is, they can then market and promote to them because they understand exactly what will really resonate. Upon completion of the exercise, clients are amazed at how similar in purpose, values and characteristics their ideal client is to themselves. In this case, like attracts like. Author Martha Beck says it in the following way, “ You spot it, You got it!” This is not at all about the demographics of the market you may be targeting. It’s deeper than even the psychographics. We are talking about the core quintessence of your ideal customer. Once you are aware of who your ideal client is you actually become more attractive to your ideal client. You probably already have an ideal client. It’s the one that you feel like you have known forever right off the bat. They enjoy the same things as you. They accept your suggestions and recommendations. They don’t push back. They are a raving fan in that they refer others to you. You have similar values. You may share similar life experiences, hardships and triumphs. You feel most relaxed and yourself when you are with them. How would you like to have a lot more clients just like them? Just be yourself. Make it up, make it fun and make it happen! If you haven’t asked your clients, “What’s your plan if you get sick?”, then you may be missing an opportunity to protect your clients’ assets through retirement, as well as provide a legacy for their loved ones. In 2016, the average annual cost for Long-Term Care in a shared-room facility was $72,000-$120,000, and an average benefit period was just under 3 years. Secure Lifetime GUL 3 delivers guaranteed protection. Clients have always loved the concept of certainty. In today’s world, they may appreciate it even more. Certainty for their families and businesses. Certainty for themselves. Certainty in the face of volatile markets and changing needs. Secure Lifetime GUL 3 provides the long-term guarantees that clients are asking for. It’s a new class of GUL with a unique combination of features and benefits. And it’s designed to provide your clients with security and peace of mind – whether they die to soon, live too long or get sick along the way. Protective’s mission is to help customers find the financial security they so desperately need, enabling them to protect tomorrow and embrace today. It’s a liberating feeling – one experienced when focus is allowed to return to those things that enrich our lives the most. At the heart of Protective’s business philosophy are four adopted values. Each equally shapes their identity and guides all that they do. Do the Right Thing: Character is doing the right thing, even when no one is looking. A collective responsibility to do what’s right by our customers to ensure their financial needs are met today and tomorrow. Serve People: To help customers protect tomorrow and embrace today, placing their financial needs first and taking the time to truly understand the challenges they face in life. Build Trust: Hard won but easily lost, earning the trust of customers is just as imperative as keeping it for a lifetime. Do the right thing and serve people, and do it with sincerity and transparency. Simplify Everything: From product design to choice and delivery to service support, the goal is to make doing business easier by making it as simple as possible. They educate customers using relatable concepts and terms to address their specific financial needs. It’s their belief that an informed customer is an empowered one. The Annuity Lead Episode 8: The Secret of an LTC Annuity! The Annuity Lead Episode 7: Giving You More! In this episode of “The Annuity Lead” Josh explains how FPG is going to be providing even more to help support your due diligence efforts and record keeping as a result of the June 9th 2017 DOL Fiduciary Rules (partial implementation). Specifically, when you are presenting a fixed index annuity with lifetime income rider, FPG will include a spreadsheet comparison of income rider options. In this episode of “The Annuity Lead” Josh is traveling back from a conference where he presented key points of the DOL Fiduciary Rule and provided the attendees access to a powerful guide. He is now giving you access to that same guide along with an overview of the most important points of conducting annuity business today! Be sure to click here to download the North American DOL guide! In this episode of “The Annuity Lead” Josh give’s a brief summary of the DOL Fiduciary Rule, Post Delay, as it relates to sale of annuities under PTE 84-24. Did you know that married couples retiring at age 65 will average $260,000 in healthcare costs? Even more will be needed if a chronic illness care is required! This makes healthcare the second largest expense in retirement. Many clients’ portfolios are not prepared for the impact of a long-term care need. Instead of carving out a sliver of assets to cover this event, many Financial Advisors will watch their clients’ portfolios dwindle as they spend down those investments year after year to pay for long-term care expenses. An FA in Pittsburgh had a client with sizable nest egg worth around 2 million. The FA never thought about covering this client in the event of a long-term care need, as the client had enough assets to “self-insure” if the situation came up. Fast forward several years. The client was diagnosed with dementia and was confined to a nursing home for over 12 years. The client’s children were forced to spend down over $1.5 million dollars. Not only were the heirs out $300,000 per child, but the advisor lost their potential investment too. When the client passed away, her children took what little assets were left in her portfolio and moved them to another FA, their trust in the first advisor having been destroyed. Don’t be this advisor! If the FA had simply suggested the client carve out a sliver of their assets to purchase the LTC rider, the clients’ portfolio may not have been depleted. The beneficiaries’ trust would have stayed with the FA, and their assets could have gone to the FA too! There are many benefits of owning a permanent life insurance policy. First and foremost is the life insurance death protection. Additionally, one of the many benefits that can be utilized along the way, if necessary, is access to the policy’s accumulation value for the benefit of the policy owner while living. For instance, accumulation value can be used as a supplement during the policy owner’s retirement years. Investment returns are variable and unpredictable. The order of returns has an impact on how long a portfolio will last if the portfolio is in the distribution stage and if a fixed amount is being withdrawn from the portfolio. Negative returns in the first few years of retirement can significantly add to the possibility of portfolio ruin. Let’s assume we have a client that has accumulated a retirement portfolio of $1,000,000 at his retirement age of 65. This retirement account is going to be invested in an index fund that mirrors the S&P 500. This client’s goal, with this asset, is to withdraw $50,000 a year pre-tax to help support a portion of his post-retirement lifestyle. 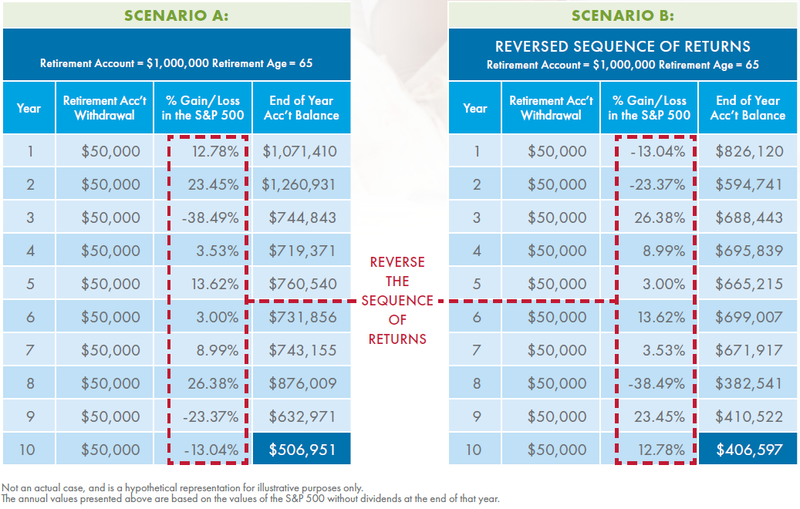 If he retired and experienced the sequence of returns in Scenario A, after a 10 year timeframe, he would have ended up with a projected account value of $506,951. But what if we simply reversed the hypothetical rates of return? The results of the reversed sequence of returns is shown in Scenario B. By reversing the sequence of returns this client would have an ending account balance of $406,597. Unfortunately we can’t control what the market is going to do when we decide to retire. But there is a possible solution to help protect a client in years when the market does go down….Max Accumulator+. 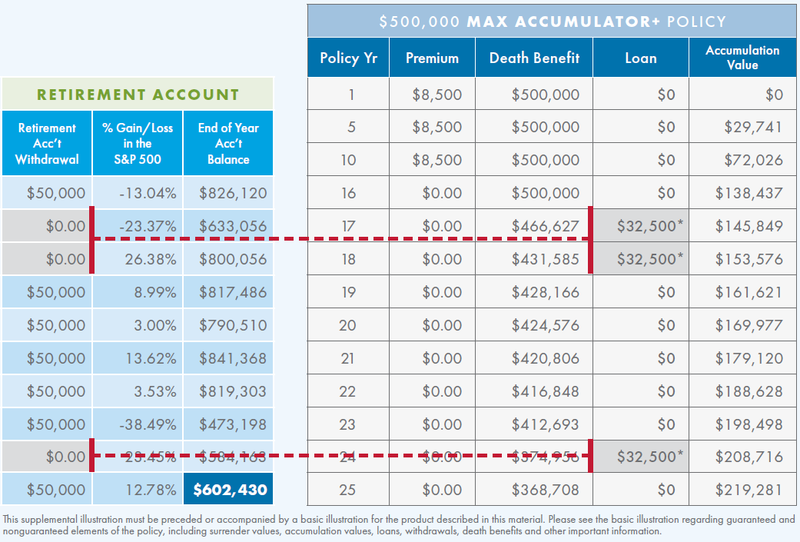 If the client had purchased American General Life’s Max Accumulator+ when he was 50 years old, he could have funded the policy and utilized the power of IUL (upside potential with no downside risk due to market performance) to create an additional bucket of money that could be used as backup income source for the years following negative performance in his retirement account. Below is an example of the resulting scenario when using an IUL.